Social networks have infiltrated different areas of world to varying degrees. 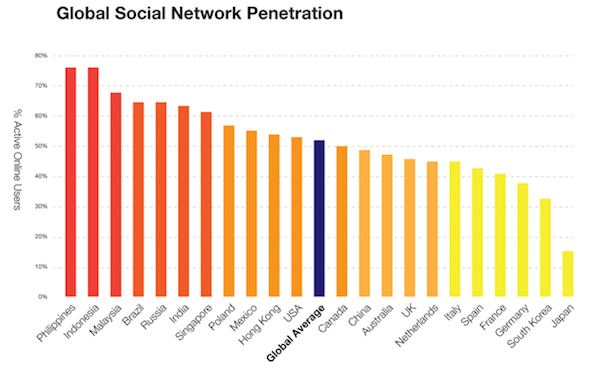 Surprisingly, the United States is only slightly higher than the global average in terms of the percentage of the population engaging in social networking. Perhaps even more surprising, Japan comes in last of the countries recently surveyed, and the United Kingdom is actually lower than the global average. 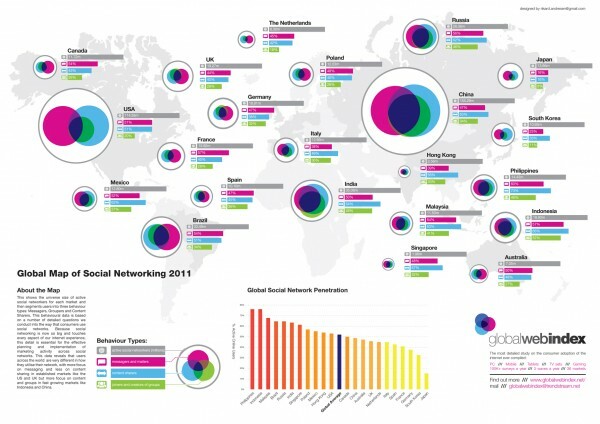 Of the countries surveyed, the Philippines and Indonesia had the highest percentage of the population using social networks. The company Trendstream utilized surveys to assess three different social network behaviors in 36 different global markets. The 3 behavior categories were messagers, groupers, and content sharers. Groupers are users creating groups on social networks. Some countries, such as Canada and the United Kingdom, had more users engaging in the sending of messages. However, some countries in Asia and around the world engage in more content sharing. Countries such as Japan and South Korea had low percentages of users known as groupers. One could easily assert that social network users in different cultures engage in internet and social networking behavior differently than users in other areas of the world. While the World Wide Web is the same worldwide, this does not mean that access is lacking in variance. The graphic is very helpful, Chase. It really let’s us “See” the differences.